I was looking for something to put on my iPod my audiobook supply was getting pretty low and the website Learnoutloud.com provided some filler. Every Fridy Learnoutloud.com provides links for free audiobooks or lectures, most of the audiobooks are public domain productions through LibriVox. I have listened to some LibriVox productions before and was never impressed, LibriVox is a volunteer system, people volunteer to read books and LibriVox releases them. This time around I noticed it wasn’t a LibriVox production so I decided to give this one a chance, after all I’ve always wanted to be able to say I’ve read Kafka. And it was definitely a step or two above the ones I’ve heard from LibriVox. While listening to this audiobook I had to do some research on the book and was surprised to find some of the references to the book, some from “The Simpsons” tv series and in the movie “Flushed Away.” Hey, with “The Simpsons” referencing the book, it had to be good, right? Actually finding those references are what kept me listening to the book. The story itself was exactly what I like to read, and the reader, Michael Scott (no not the character portrayed by Steve Carell, although that would have been interesting) read the book well, although he may have intended his reading for a younger audience, judging from his delivery, but he had Kafka’s words, or rather a pretty darn good translation, to work with and kept me listening. 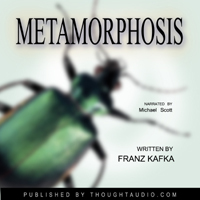 Published in 1915, “The Metamorphosis,” tells the story of Gregor Samsa, who wakes up to find that he has been transformed into a giant insect. When I first heard about the book I heard that he had been transformed into a cockroach, and that’s what many of the pop culture references seem to say, but after reading and hearing Gregor’s description of his body in the book, I gather it’s more of a beetle of sorts. At one point the maid that teases him refers to him as a dung beetle, but that is out of jest and hard to say that’s what he actually is, so let’s just go with insect for the sake of this review. Gregor wakes to knocking at his door, but with his new insect body can’t seem to get out of bed, he responds but the sounds he makes are pretty much unintelligible. The person knocking at the door is the chief clerk from the company where Gregor is a traveling salesperson. I thought it was interesting the traveling salesperson and cockroach transformation at this point seemed pretty tongue in cheek, but with the insect form not fully defined this may not have been intentional. Apparantly Gregor is so enslaved by his company that he can’t even call in sick. As the family entreats Gregor to open the door, he refuses. Mrs. Samsa insists that Gregor must be ill or he would not be acting like this. The chief clerk loses his temper and tells Gregor that he is shocked by his attitude, insisting that his position in the company is not unassailable because his work has been poor lately. Gregor is angered by this speech, and insists that he is simply feeling slightly indisposed but will soon return to work. He retorts that his business has not been bad lately. Because of the changes in Gregor’s voice, no one outside understands a word he says. Fearing he is ill, his parents send Grete and the servant girl to get the doctor and the locksmith. With great difficulty Gregor manages to open the door by himself. Seeing Gregor, the chief clerk backs away while his father begins to weep. Here’s where it gets weird. Why doesn’t the family flee in terror? Gregor begs the chief clerk to explain the situation at the office and to stand up for him. He says that he will gladly come back to work and asks the chief clerk not to leave without agreeing with him. Gregor tries to stop the clerk so as to keep him from leaving with such a negative view of things, but then his mother, backing away, knocks over a coffee pot, causing a commotion and giving the chief clerk an opportunity to get away. Gregor’s father picks up a walking stick to drive Gregor back into his room. Gregor gets stuck in the doorway, and his father shoves him through, injuring him in the process, and slams the door behind him. The family doesn’t realize Gregor can understand their speech so no one talks to him directly. He learns what is happening by listening to their conversations through the door. He finds out that the family has money saved from his father’s business, which had collapsed five years ago. Gregor had not known about this money, and when his father’s business fell apart, he had thrown himself into his work in order to provide for his family. The family’s initial excitement of receiving his earnings had worn off, however, and he remained intimate only with Grete, whom he had wanted to send to the Conservatory to study the violin. Gregor watches his movements carefully, since any noise he makes distracts his family. He learns from their conversations that in addition to money from the business, the family has also saved money from his salary, but it isn’t enough to live off of for very long. Gregor feels deep shame every time money is mentioned. He finds that his vision is getting worse, so that he can no longer see across the street. Every time Grete walks into the room, she runs to open the window, which bothers Gregor. Realizing that his sister is uncomfortable in his presence, Gregor figures out a way to cover himself with a sheet to keep out of sight. Gregor’s parents never come into his room, and when his mother begs to see her son, the others hold her back. Gregor discovers that he enjoys climbing the walls and the ceiling. Noticing this, his sister decides to give him more space by clearing the furniture from his room, and she asks her mother to help. Gregor’s mother says that this will make it look like they are giving up on Gregor’s recovery, but Grete disagrees. Hearing his mother’s voice, Gregor realizes the importance of the furniture to him. The noise that the women make upsets him, and he decides to come out of hiding to save the framed picture on the wall from being taken. Seeing him, his mother faints and Grete runs out of the room for medicine to revive her with. Gregor follows and when his sister sees him she runs into his room and slams the door, trapping Gregor outside. His father arrives to find him out of his room and begins throwing apples at him. One of these lodges itself in Gregor’s back, almost crippling him. As he loses consciousness, his mother begs her husband to spare her son’s life. Gregor’s injury makes the family decide to be more accepting of him, and they leave his door open so he can watch them. They are very quiet most of the time and extremely tired from the jobs they have taken. No one bothers with Gregor too much. They have replaced the servant girl with a maid. Gregor, lying in his room, resorts to his memory. The family considers moving, but can’t because they don’t know how to move Gregor. He becomes angry that he is being neglected. Grete barely cleans his room and doesn’t bother very much with his food anymore. When his mother tries to clean the room in Grete’s absence, this triggers a family fight. The maid, discovering Gregor, is not repulsed but rather spends her time teasing him, which annoys him to no end. Three lodgers have moved into the apartment, and the excess furniture, as well as all superfluous junk, is moved into Gregor’s room so that he barely has room to move. He also stops eating almost entirely. The door to his room is now usually kept closed because of the lodgers, but Gregor doesn’t care any more and often ignores it even when it’s open. The lodgers, who are domineering and receive too much service and respect from Gregor’s parents, ask Grete to play the violin in the living room when they hear her practicing. She begins to play, but the lodgers are soon tired of this and move away to show that they are disappointed with her playing. Gregor, however, is drawn to the music and crawls out of his room to get closer, dreaming of getting Grete to play for him in his room and of telling her about his plans to send her to the Conservatory. The lodgers suddenly notice Gregor and give notice immediately, saying they will not pay for the time they have lived there. Grete steps forward and tells her parents that they have to get rid of Gregor. He is persecuting them and trying to drive them out of the apartment and, if he really were Gregor, he would have left of his own accord and let them live their lives in peace. Suddenly realizing that he feels only love and tenderness for his family, Gregor understands that his sister is right and he should disappear. He returns to his room, waits until sunrise, and dies. Gregor’s family is happy, but they also mourn his passing. At this point the story becomes a weird “happily ever after” story but in an absurd way. You’ll have to read it for yourself to find out why.